"The best way to promote the change of society for the better is to develop entrepreneurs, the heroes of today's global society," says Dean Santiago Iniguez of IE Business School in Spain. Since 2004, he has guided affairs at one of the top eight business schools in the world (according to the Financial Times rankings 2011). Recently he published a book, The Learning Curve, which addresses the challenges that face global business schools and the ways to surmount them. 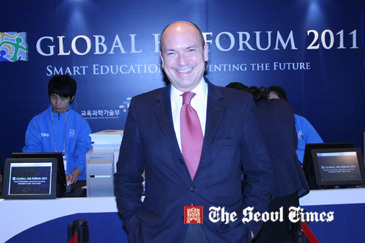 From Nov. 1 to Nov. 3, Mr. Iniguez attended the 2011 Global HR Forum at Seoul's Sheraton Grande Walkerhill Hotel, where he took time to speak to The Seoul Times. Q1: Welcome to Seoul. What brings you here? A1: The Global Human Resources Forum invited me to be one of the speakers at their annual conference. Additionally, I will have a meeting with the IE Business School Alumni based in Seoul and will visit KAIST, my school's academic partner in Korea. Furthermore, Seoul is always an attractive venue for many types of events: a cosmopolitan city with excellent standards of service, ample business and cultural offerings and, most of all, lovely people. Q2: I noticed you'll participate in a session titled "How Top Global MBA Schools Prepare for the Future Challenges in Businesses, Industries and Economies". I realize it's a big topic, but could you describe what some of those challenges are and how global MBA schools should meet them? A2: I believe that the main mission of business schools is to develop good managers and entrepreneurs. Management — good management — matters now more than ever. What the world needs now, in times of crisis, is good entrepreneurs, good managers, and good business leaders. I believe that the best remedy for the world's ills, the best antidote to combat intolerance or the clash of cultures, or poor foreign policies is to develop good managers, create new businesses, innovate, and to generate value and wealth at all levels of society. Dean Santiago Iniguez of IE Business School in Spain poses with top designer Lie Sang-Bong. In my book The Learning Curve, the object of my presentation at the Global Human Resources Forum, I explain that it is through better research, better education programs and a faculty more focused on the needs of the real world that we would be better equipped to provide creative responses to the demands that society puts on managers. Indeed, the best way to promote the change of society for the better is to develop entrepreneurs, the heroes of today's global society. Many schools are the cradle of entrepreneurs and a propitious environment for the generation and promotion of start-ups, the rejuvenation of mature companies or the revamp of family businesses. At IE Business School, for example, entrepreneurship has been a core part of the MBA since the start. Our school is a hub for entrepreneurs, venture capitalists, investors and business angels. The entrepreneurial spirit is part of our institutional DNA. This results in graduates who share this entrepreneurial impetus in all sort of business and institutional organizations, from large corporations to non-for profits or the public administration. Q3: Do you think these challenges apply to all institutions of higher learning (undergraduate, graduate, PhD), or just business schools in particular? A3: Higher education is one of the most fascinating and fastest growing industries in the world. Today, it is experiencing change on a scale unprecedented since the foundation of the first universities. The internationalization of all stakeholders — students, faculty, employers — the impact of new technologies in the learning process and the diversity of educational institutions are transforming the landscape and the nature of higher education very rapidly. In this context, my view is that business schools have been and will remain as the icebreakers of higher education in all those process. The transformation of higher education is reflected, for example, in the change of the profile of students at universities. On the one hand, the new generations come with new and fascinating skills developed from their active use of technologies and presence in global social networks. On the other hand, the enlarged expectancy of human lives tied with the need of constantly updating professional knowledge and skills will make the adult population the fastest growing segment for many universities. All these factors and other will require much more dynamism and market orientation from universities. Q4: In terms of competitiveness, where do you think Korea's B-schools stand? What special challenges do they face, either from within or internationally? A4: Korea has become an international hub of business education over the past decade. The business schools belonging to three universities, Seoul National University, Sogang and most notably KAIST enjoy international visibility and reputation. Generally, economic and business growth in a given country is concomitant to the flourish of management culture and business schools. Indeed, business schools contribute to transform the corporate landscape of their environment and develop the talent needed by large corporations. This phenomenon has happened in Korea too. Moreover, Seoul has become an educational hub in Asia along with some other capitals like Singapore or Hong Kong. In order to consolidate their competitive positioning, Korean business schools may need to further internationalize their activities, for example by offering more programs in English or by entering more fully the executive education market. Seoul is geopolitically positioned in East Asia and may attract many foreign students, not just from neighbouring countries like China or Japan, but also from other continents. Something that contributes to this attraction is, for example, the expertise developed over the past years in manufacturing, electronics or the digital industry developed by Korean companies. Q5: Tell us some about yourself and your career – what led you into not just business or business education, but the business of business education? A5: Let me recall a song: "You only live twice: one life for yourself, and one for your dreams," warbled Nancy Sinatra over the opening titles of an otherwise forgettable sixties' James Bond movie. But those of us who work in education really can say that we live twice: we live our own lives; and we also live out the dreams of the students with whom we have worked and whom we have known, and whose development we have contributed to. I consider myself enormously fortunate to have been able to dedicate my life to teaching, a vocation I identified while still very young when I would give classes to my uncomplaining younger siblings; it's a vocation that has only increased over the years. However, my work as an academic manager and Dean has provided me with many satisfactions and provided enormous knowledge and experiences. It is in my work as academic manager that I have realized about the actual challenges of higher education and some potential solutions. Management is a fascinating activity, and managing academic institutions is even more fascinating since you find the best talented people on earth, and sometimes the most difficult too. Q6: Would you say that you are the ideal "academic kangaroo" that you describe in your recent book, The Learning Curve? A6: In my book I defend that business schools need not only "Gurus" — wise sages who originate new thought, but rather "Kangaroos" — academics able to jump from their research tasks to teaching, and from there to consultancy or an interview with a journalist. Kangaroos of this type are not born, but trained, and it normally requires a wide career span to exploit the necessary synergies between those different, apparently contradictory, but actually intertwined activities. Personally, I also try to develop the complementary facets of researcher, teacher and interface with the top management in my professional life. My experience is that the three are interdependent and indispensable for an academic. Q7: What makes a good manager in your opinion? A7: In my book, The Learning Curve, I propose a definition of what could be consider a good manager. I explain that here is neither a magic formula nor other short cuts for turning somebody into a consummate manager. Good managers are made over time, based on the systematic exercise of good habits and routines, and as a result of accumulated experience of their sector and their relationships. To reach the heights of management excellence requires discipline and hard work, and not achieved simply through the passage of time. The learning curve is steep and requires the combination of three basic conditions. First, good managers systematically practice what might I call "managerial virtues", those habits or character traits that are acquired through the constant exercise of good practices and routines over time, like hard work, modesty, curiosity or resilience, among many others. Second, managers should realize about the importance of lifelong learning, since management is a clinical discipline and requires the permanent update of knowledge and skills. That is why I recommend that MBA graduates come back to school for an update every five years. And third, managers should combine the study of the different management disciplines with the humanities and other social sciences. Q8: We don't typically think of an MBA as the type of person who dabbles in the arts or social sciences, so I'm particularly interested in your view that the humanities should be a part of business education. Why do you believe this, and how does your view manifest itself on a practical, curriculum level? A8: At IE Business School we believe that MBA programs should Include humanities in the business curriculum and we constantly renew the contents of business education, given the clinical and changing nature of management, the object of its study. I think that managers can receive a much better rounded education if traditional business disciplines are complemented with courses from the humanities and social sciences. Management is not about techniques, but rather about leading people in complex organizations in a widely diverse world. You may learn more about how to lead working teams by reading Dickens or Scott Fitzgerald, for example, than some bestselling books on leadership. Or you may develop distinctive skills like observation, key to taking good decisions, by attending a course on design thinking. I do also believe that business schools should reinforce the social commitment of their students and the practice of what I describe in my book as "managerial virtues". Entrepreneurs and managers can be depicted as the Architects of Social Structures when they perform their work with competence and honesty. Q9: What do you like to do in your spare time? A9: I enjoy reading, listening to music, writing, enjoying the company of my family and my friends. I admit I very often continue thinking about work in my spare time. I am not sure if I see clear what are the boundaries between professional and private life. I am passionate about my work, I guess. Iniguez has his own blog at www.santiagoiniguez.com and is co-editor of www.deanstalk.net, a blog focused on management education issues. He tweets under SantiagoIniguez.